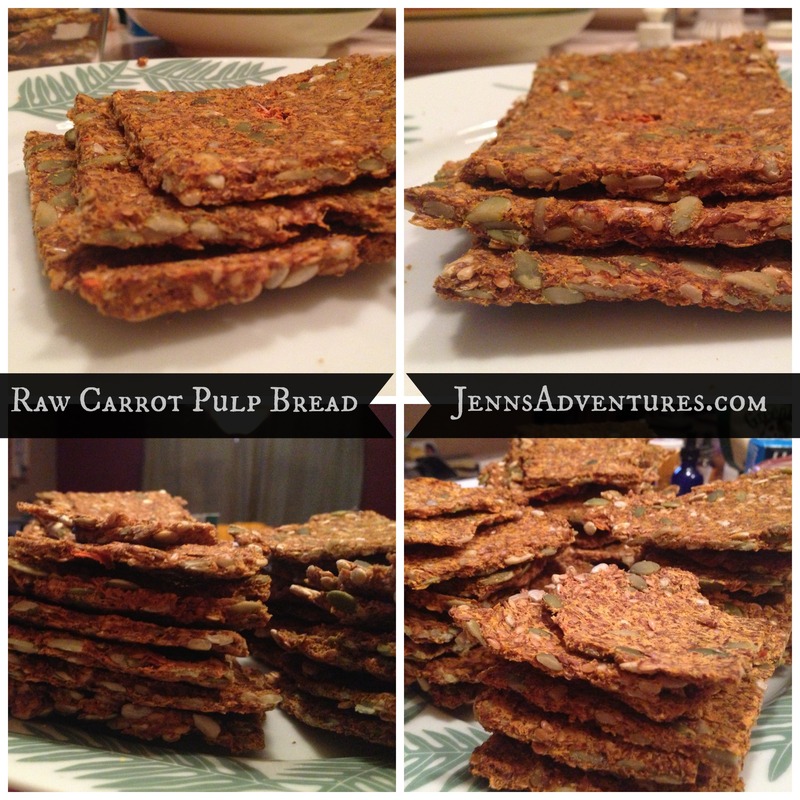 Raw Carrot Pulp Bread + Spicy “Cheese” Spread! Is it just me, or do most people literally cringe when having to throw food away? Hopefully I’m not the only one — for more reasons than one! This post is intended to inspire and encourage you to try something you otherwise may not have! If you do a lot of juicing like I do, you have probably thought of ways to salvage your pulp. Unless you have a Welles Press or Norwalk of course! 😉 Maybe you’ve attempted a recipe or saved a bag of pulp in the freezer with good intentions of trying a recipe, but ultimately never followed through. Well here’s an easy recipe you can try riiiight now! Honestly, I’m not sure why it took me as long as it did to finally do this, much less share it with all of you — so this post is definitely overdue! My household consumes A LOT of produce and while there are LOTS of recipes out there, this is definitely a favorite! One of my favorite “go to” or “staple” juices you’ll ALWAYS find in “Jenn’s Kitchen” is Apple, Beet, & Carrot. This concoction is a major cancer-fighter and the juice recipe isn’t difficult to remember: equal parts. 😉 And the best part? 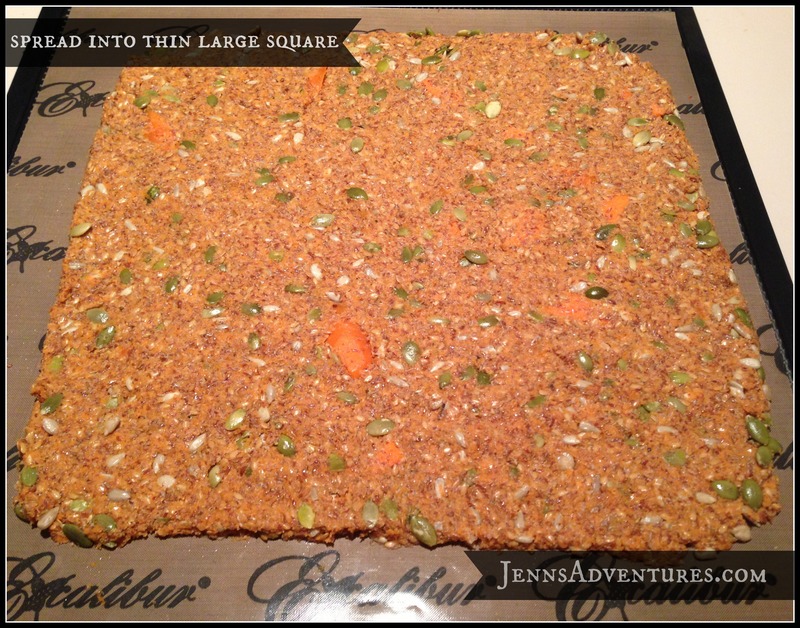 You can make Raw Carrot Pulp Bread after! I strongly suggest making the following “cheese” spread to go along with it… because it’s absolutely AMAZING! 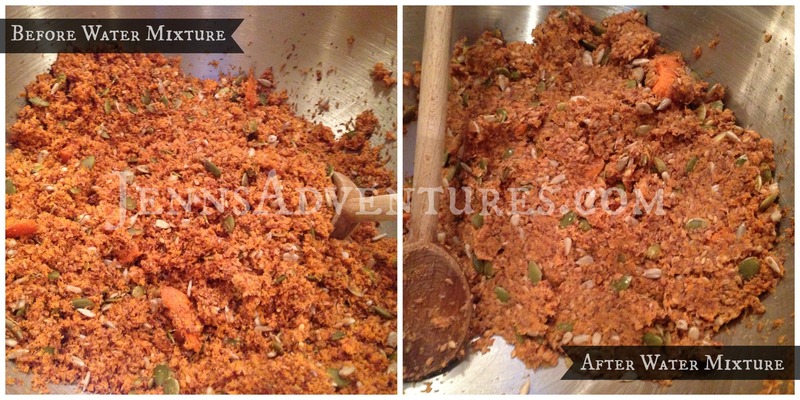 Ingredients: 2 Cups Raw Cashews (Soak for at least an hour) 1 Cup Raw Hulled Sunflower Seeds (Soaked for at least an hour) 1/2 Cup Nutritional Yeast 1/4 Cup Chopped Scallions 1/4 Cup Juiced Lemon 2 Tablespoons Turmeric 2 Tablespoons Paprika 1/2 Teaspoon Chili Powder 1 Garlic Clove 1 Teaspoon Sea Salt 1/2 – 1 Cup Water Directions: 1) Place all ingredients except for water in food processor or VitaMix (Might have to do this in small batches) 2) After blending and scraping sides, slowly add water in increments and continue blending. *Remember, the more water you add, the runnier your mixture will be (thick/thin, creamy/crunchy — up to you!) 3) As an afterthought I folded in an additional 1/2 Cup of Nutritional Yeast (because I’m obsessed with it & buy bulk) 4) Store in a glass container and refrigerate to preserve if you don’t eat it all in one sitting 😉 Note: Again, this recipe yields A LOT of cheese spread, so feel free to cut everything in half or freeze to preserve a back-up batch. Sounds amazing right?! Perfect for entertaining and packs well for a road trip! Do you juice? I juice as often as possible. I usually juice everyday, but sometimes my schedule does not allow that luxury. If I’m ever on the go and need what I call “fast food” my go to juice is Suja because I know it’s organic, free of GMO’s, and cold-pressed opposed to pasteurized. What kind of juicer do you have? I have the Breville Juice Fountain Elite, which is definitely worth the investment if you’re getting into juicing. However, if I was currently looking for a juicer, the next juicer I would invest in would most likely be the Green Star Elite 5000. I’ve also been eyeballing the Welles Juice Press, which might actually become less necessary if I did invest in the GSE 5000!? What other juice pulp recipes are there? There are SO MANY juice pulp recipes to be created and this is definitely the first recipe post of many! Expect more pulp recipes for breads, crackers, muffins, etc.